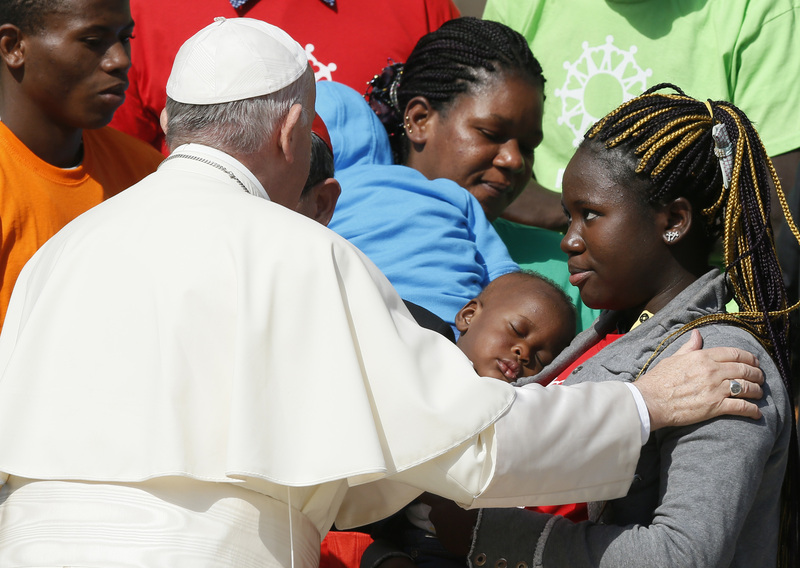 Pope Francis today launched a two-year global campaign by Caritas Internationalis, called Share the Journey, to assist families forced to migrate and promote Catholic social teaching on refugees and migrants. There are 65.6 million forcibly displaced people in the world today, according to a United Nations agency, the most since just after World War II. Overall, there are 244 million migrants in the world, according to Caritas. The campaign is calling, among other things, for a week of prayer and action for migrants and refugees Oct. 7 through 13, suggesting special prayers at Masses, prayer vigils and speaking events as ways to teach about people on the move. The campaign will also take advantage of designated days throughout the year to raise awareness, including the feast of Our Lady of Guadalupe on Dec. 12. Presenting the campaign at a Vatican press conference, Cardinal Luis Antonio Tagle, president of Caritas Internationalis, appealed to governments worldwide, “don’t close the doors” to migrants “because you could be closing the doors to those who might enrich you.” He recalled that his own grandfather came from China to the Philippines as a poor migrant. Cardinal Tagle explained that the Caritas campaign seeks to contribute to the building of stronger communities and more inclusive societies, to promote “the culture of encounter” across the globe, and to increase the opportunities for migrants and host communities to learn more about each other. Caritas Internationalis is a global confederation of 165 national development agencies. It is the charitable arm of the Catholic church that works at diocesan, regional and international levels on issues such as poverty, migration, climate change, hunger, health and natural disaster. In many countries it is known under the name of Caritas, but in the United States it’s called Catholic Relief Services. At the press conference, the cardinal and other participants including Sister Norma Pimentel, executive director of Catholic Charities of the Rio Grande Valley in Texas, made clear that all Caritas member organizations are invited to promote the campaign at local and national levels; bishops’ conferences and local faith-based organizations are also invited to participate. The new initiative effort will give Catholics the opportunity to learn and explore Catholic social teaching on refugees and migrants, said Joan Rosenhauer, executive vice president of U.S. operations for C.R.S. “Catholic social teaching has clear messages of caring for strangers, the importance of hearing their stories and understanding their needs,” she told Catholic News Service. The campaign will be bolstered by support from ACT Alliance, a network of 145 Christian agencies worldwide, and a variety of other religious congregations and civil society organizations. The Jesuit Refugee Service is also fully engaged in this campaign. “The campaign is of the utmost importance “to open minds and hearts,” Sister Pimentel told America. As Pope Francis has said, the world is experiencing a humanitarian crisis the likes of which has not been seen for several decades. According to the United Nations High Commission for Refugees, the 65.6 million forcibly displaced people in the world today include 22.2 million refugees, and 10 million stateless persons. Moreover, 28,300 people are forced to leave their homes each day because of armed conflict or persecution. The U.N. agency reports that 55 percent of the refugees come from three countries: Afghanistan, South Sudan and Syria. It reports that 30 percent of displaced people are being hosted in Africa, 26 percent in the Middle East and North Africa, 17 percent in Europe, 16 percent in the Americas and 11 percent in Asia and the Pacific. According to Caritas, the total number of migrants in the world increased from 173 million in 2000 to 244 million in 2015. The agency noted the most rapid increase in migration between 2000 and 2015 came from middle-income countries; there are now 157 million migrants from this group of nations. Much of the campaign’s effort will be focused on sharing stories about migrants and refugees, the struggles they face and why they chose to seek a better life elsewhere, said Kristin Witte, coordinator of domestic Catholic educational engagement at C.R.S., which is the U.S. bishops' overseas relief and development agency. “The hope is that through the stories that are presented, the images presented, that people will be moved from their place of comfort to a place of encounter. That’s what the church is calling us to. That's what the pope is calling us to,” she said. The Caritas coalition of Catholic organizations has developed a toolkit in English and Spanish that includes prayers, suggestions for activities for families, prayer groups, classrooms and clergy, and utilizing social media with references to #sharejourney. In Rome, Pope Francis extended a greeting to the representatives of Caritas Internationalis from many countries, gathered in Rome for the opening of the global effort, led by Cardinal Luis Antonio Tagle, archbishop of Manila, the president of the organization. He also greeted the representatives of the organizations of civil society that are engaged in assisting migrants and refugees, together with Caritas in Italy, who have gathered signatures to get the Italian parliament to approve a new law to grant citizenship to the hundreds of thousands of children of migrants who were born in Italy. Caritas Internationalis, on its website, explains that the Share the Journey campaign has at its heart “the vision of a united, global human family.” Its focus is on “our joint journey as people on the move in departure, transit and host communities.” This public awareness campaign aims to promote opportunities and spaces for migrants and host communities to come together, to share stories and experiences with the aim of strengthening the bonds between them. With additional reporting from Catholic News Service.